All transactions are safe and secure with a reliable history in online purchasing behind each of our associates. Buy The Golden Girls Theme Song t-shirt to own Golden Girls clothing and merchandise. We know you agree with us when we say the Golden Girls rock, which is why this theme song shirt is an ideal choice. Your friends will be singing along as they admire the collage on the front. "Thank you for being a friend, traveled 'round the world and back again. Your heart is true, you're a pal and a confidant. And if you threw a party, invited everyone you knew..." You take it from there. Wear it to let everyone know exactly how you feel about this timeless series. Pick a color and you'll be ready to sing along with the opening credits. Pair it with a Stay Golden shirt. 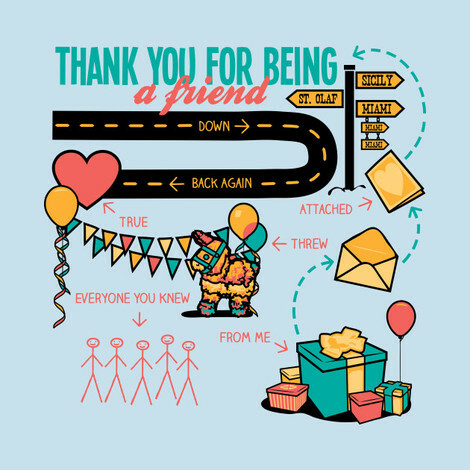 In addition to The Golden Girls Theme Song tee above, browse the Golden Girls Clothing Gallery for more apparel like men's and women's clothes, kids shirts or hoodies.